There are two main ways to view video signals, through a monitor/TV screen or via a projector and a screen. We have an extensive history installing both types of products. We sell and install a number of different LED and LCD flat-panel televisions, ranging from 20″ up to 70″. 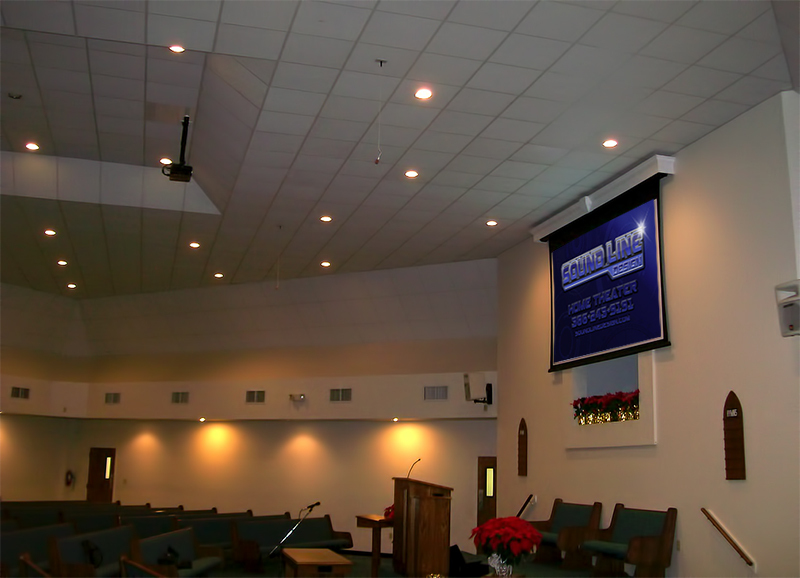 For those who need a larger viewing area, we offer projectors and screens. Many of our screen options are motorized, for simplified ease of use. Our experience allows us to expertly make recommendations on the proper projector for your viewing area. A few of the things we take into account when selecting the best projector for your project are, lighting in the room, distance from the projector to the screen, screen size, and project budget. Rest assured that we make the selection process as easy for you as possible. Many times before audio/video upgrades are selected, the room they will be installed in must first be acoustically tamed. Bad room reflections can make even the most articulate sounding speakers sound muddy and unintelligible. We supply and install a number of different acoustic solutions to a wide range of problems. If you need to distribute recorded and spoken audio in a large room, or multiple rooms we can help. We have a large selection of PA microphones, amplifiers, mixers and speakers. We can work with your business to design a system that perfectly fits your needs and your budget. In addition to public address systems in businesses, we also have experience working to maximize sound reinforcement in churches. 70 volt, or constant voltage systems are a effective, and cost conscious method of installing speakers in multiple rooms. These systems allow for multiple speakers to be used with just simple jumper setting adjustments on speaker-mounted transformers. You tell us the rooms you want to cover with sound, a relative volume you would like it to play at, and we handle the rest. These constant voltage systems are the industry standard for multi-room commercial audio, and Sound Line Design is your local source for all your audio and video needs. Give us a call or stop by today to learn more about how to enhance the audio and video at your business.